There are 16 bridges that connect the island of Manhattan to the outer boroughs, and at least a dozen of them offer pedestrian lanes. One of those 12 is the Queensboro Bridge—also known as the 59th Street Bridge and now officially named the Ed Koch Bridge. If you're feeling groovy one morning, consider taking a walk across this iconic bridge, which will give you a great view of Long Island City, the East River, and the Upper East Side of Manhattan. The bridge is more than a century old and has been known as the 59th Street Bridge due to the fact its Manhattan starting point is 59th Street. It was built when it became apparent that another bridge was needed to connect Manhattan with Long Island to ease the traffic load on the Brooklyn Bridge, built 20 years earlier. Construction of the cantilever bridge that spans the East River began in 1903, but because of various delays, the structure was not completed until 1909. The bridge eventually fell into disrepair, and after decades of decay, renovations began in 1987, costing more than $300 million (the cost of building the bridge was $18 million). Once you take a walk across this bridge, you will see why it was all worth it. 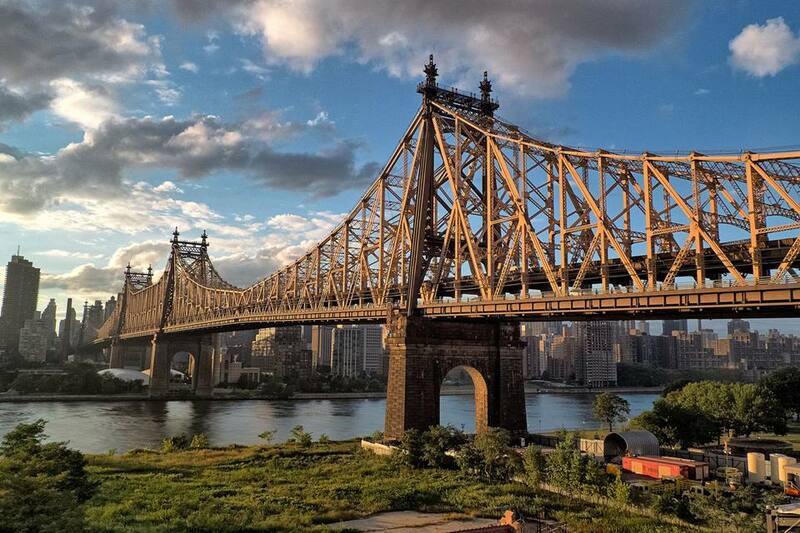 A walk across the Queensboro Bridge—nearly three-quarters of a mile long—not only offers views of its striking geometric shapes as well as the New York skyline but also allows you to explore by foot the interesting neighborhoods once you reach the other side. When you are zooming across by car, you'll probably never notice the battlement-type rooftops on the Queensbridge Houses, or explore the attractions of Long Island City at a leisurely pace. To be honest, however, the walk across the Queensboro Bridge is not as nice as the amble over the Brooklyn Bridge or even the Williamsburg Bridge, since pedestrians have to walk close to the cars. But you will be rewarded with the spectacular views from this iconic and historic structure. Whether you are starting on the Manhattan or Queens side, you need to find the pedestrian entrances. The entrance on the Manhattan side is on East 60th Street, midway between First and Second Avenues. The nearest subway stop is Lexington Avenue-59th Street, which is served by the N, R, W, 4, 5, and 6 trains. You will then have to walk two blocks east. At the Queens-end of the bridge is Queensboro Plaza, an elevated subway station. Be forewarned—Queensboro Plaza can be congested (especially come rush hour) and walking through will be slow and challenging. The entrance to the bridge is at Crescent Street and Queens Plaza North. If you are taking the subway, grab the number 7, N, or W (weekdays only).